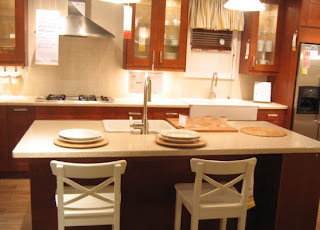 I took a trek up to the IKEA in Elizabeth hoping for some inspiration on paint colors, tile and countertops...even cabinet layout as I am still reworking those plans everyday...I've developed an OCD. I've seen a lot of people with the Adel Medium Brown cabinets go dark with everything, and I love it! But, this is hard to explain, I want a sense of fluidity from the kitchen to the family room and out into my garden. Kind of like the outdoors inside...but not. I want it light and bright. But as much as I like the look below, the longer I stood there the more it looked washed out with the light paint, counters and floors. So then I started thinking of how to do something in between. I've always had light counters without any staining problems. But I think, especially now with the little one, darker counters might be the way to go like the Pragel stone effect black. 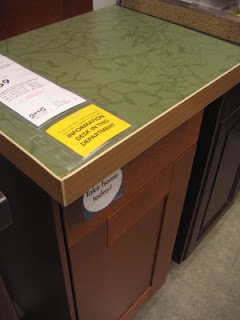 But what if I used the dark counters everywhere but how about the Numerar mistletoe pattern green for the island? They have a precut one that measures the size I'd need. 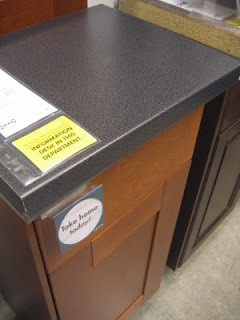 It would certainly cut down costs if I didn't have to special order a counter. Although I started to think it might behoove me to round one corner of the counter to allows for more space between it and the door. The only think I know is that I'm going with laminate. I've never had a problem with it and granite or these new eco-friendly over-priced because they're trendy options really aren't my thing. I guess it's good that I won't be ready for the counters for a few weeks now.